The location is incredible - right across from the tower of the cathedral, we stepped out the room and into the Christmas market. Frederic was great - very helpful and answered emails promptly. Nicely laid out, spacious apartments. 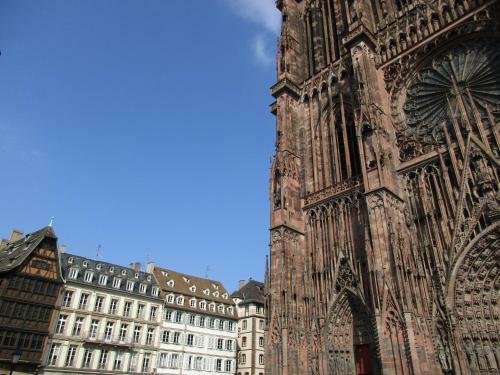 Great view of the Cathedral (Cathédrale Notre-Dame de Strasbourg). Easy walking distance from everything, including parking. Our host was very gracious and accommodating. Good documentation in the apartment for nearby sights and services, and (thank you) wifi information. The wifi actually worked, too... It was great to have access to a washer and drying rack as well. Location is excellent - just next to the Cathedral, walking distance to the major sites, and many eateries around. The host, Roth, was most helpful - friendly, responded promptly to queries and gave clear instructions on how to check-in. Location was amazing. Right at cathedral but rooms in back so very quiet. Host super helpful before trip, emailing recommendations & even calling to make sure we're set for dinner reservations due to busy Christmas markets. It's actually 3 bedrooms & a sofa bed in the living room, plenty of space for our 2 families of 4. Spoke fluent English which is very helpful. Well-stocked kitchen. 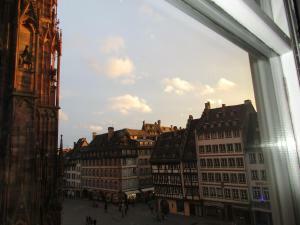 As a family of four, our plan was to make in Strasbourg a stop over in our travel between Italy and the Netherlands. As expected, location was excellent, the cathedral and main square were, literally, across the street and on top of the tourist office. The apartment was clean, well equipped and with clear instructions (in English, French and German). Plenty of information to enjoy Strasbourg was also available as well a set of alsacian recipes for those who like cooking :). Best was, however, how attentive owners were. After a long drive from Italy we were delayed due to traffic and they accommodated our (very) late arrival. We are glad to have chosen for this apartment instead of a more efficient motorway accommodation. The location is obviously perfect for touring Strasbourg! And while there is no on site parking there is a parking garage 5 minutes from the apartment. The host was wonderful and very easy to communicate with. The beds were very comfortable and the rooms were dark and quiet. My kids even slept in! That's when you know a room is comfortable. :) The kitchen is well equipped to easily prepare meals however we found tons of yummy places to eat in town. The Raven Cafe was great for breakfast and we had delicious falafel at Houmous & Co for lunch. We tried a few coffee house but Au 5 was our favorite. The staff is very friendly, the seating is cozy, and the coffee is tasty. 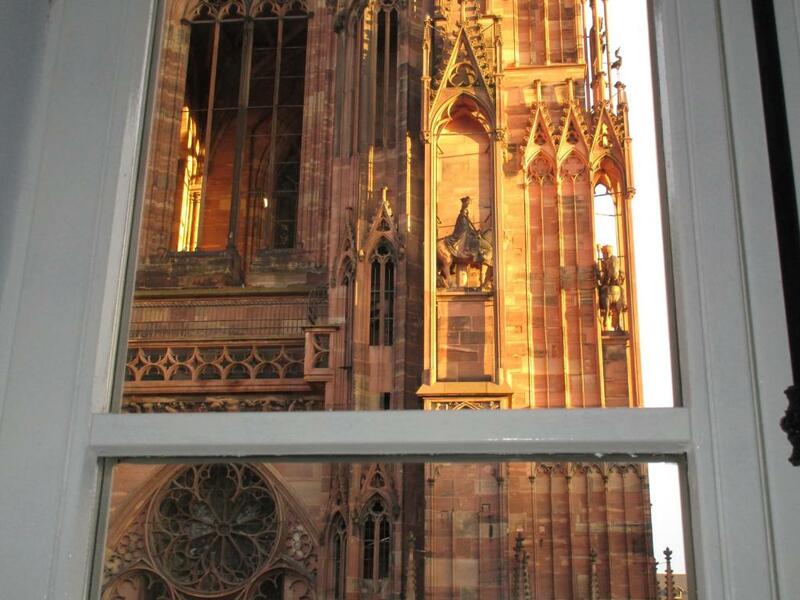 We hope to go back to Strasbourg again soon and would definitely book Apartement Place De La Cathedrale again. Beautiful view from the apartment and very convenient location. The apartments are beautiful! Great host! 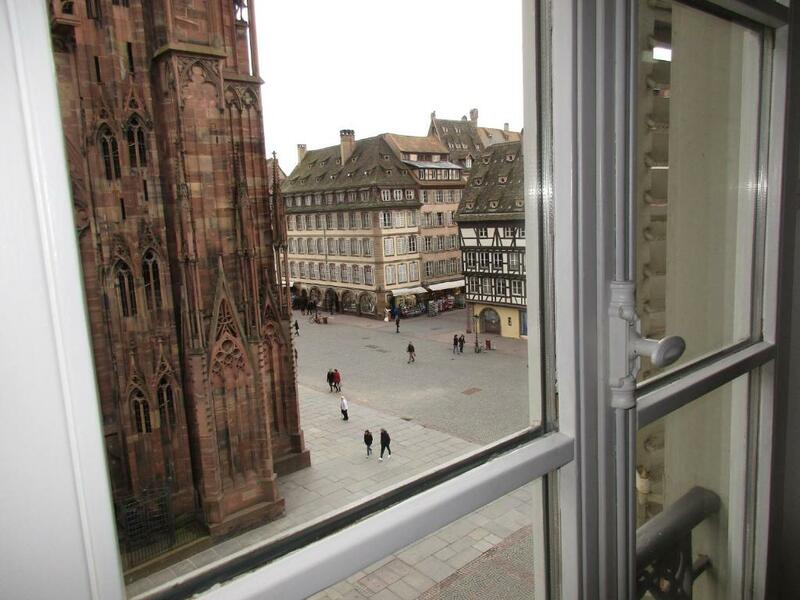 Lock in a great price for Les appartements Place de la Cathédrale – rated 9.5 by recent guests! 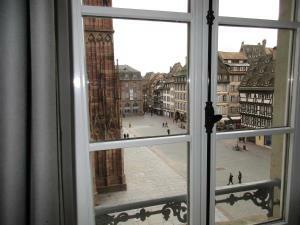 Apartement Place De La Cathedrale is located in Strasbourg, a few steps from Strasbourg Cathedral. Strasburg History Museum is 650 feet away. Free WiFi is offered throughout the property. The accommodations is fitted with a flat-screen TV and DVD player. All units have a kitchen equipped with a microwave and toaster. A fridge is also featured, as well as a coffee machine and a kettle. Every unit has a private bathroom with free toiletries. Towels and bed linen are provided. Strasbourg Christmas Market is at the foot of Apartement Place De La Cathedrale. 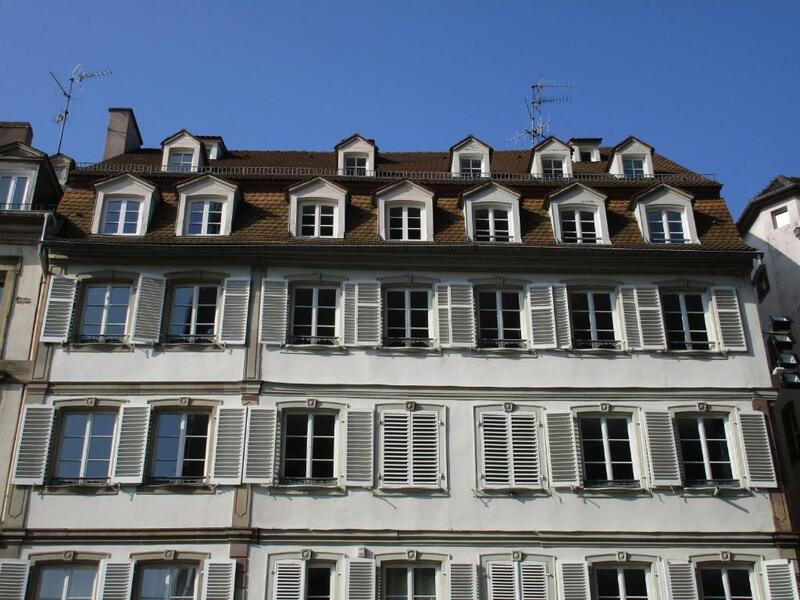 The nearest airport is Strasbourg International Airport, 6.2 mi from the property. 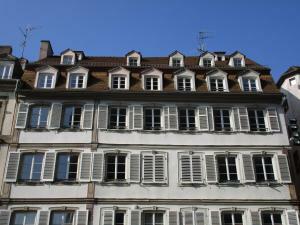 뀐 Located in the real heart of Strasbourg, this property has an excellent location score of 9.9! 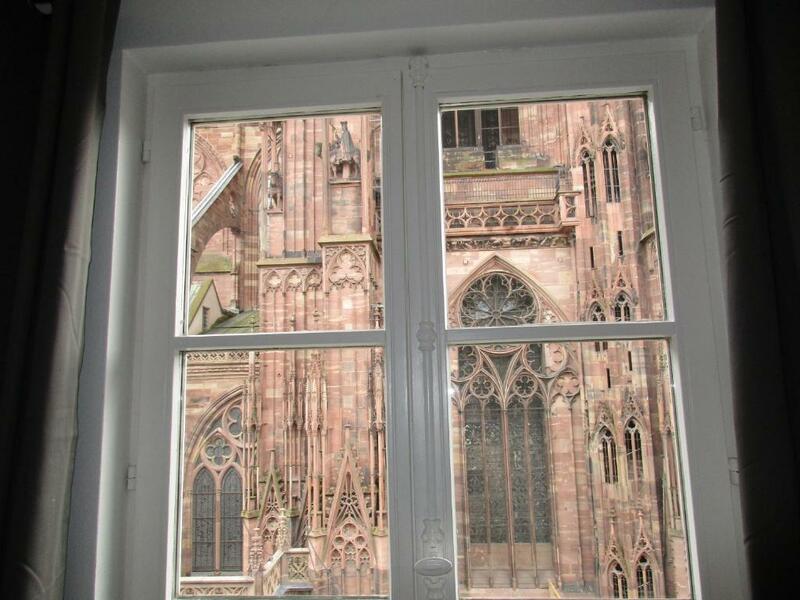 When would you like to stay at Les appartements Place de la Cathédrale? Deux très beaux appartements de 85m2 et 45m2, rénovés et entièrement équipés, situés plein centre-ville, place de la Cathédrale, au 3ème étage avec ascenseur d'un immeuble du XVIIIième s., avec vue imprenable sur la face Nord de la Cathédrale. L'immeuble est voisin de l'Office du Tourisme et se trouve au niveau de l'enseigne BATORAMA (au RDC de l'immeuble), enseigne spécialisée dans le tourisme fluvial sur Strasbourg. Inclus dans la réservation : - Articles de toilette (savon / shampoing), sèche cheveux - Plan de Strasbourg et guides touristiques - Téléviseur LED HD et accès WIFI gratuit - Possibilité de mettre à votre disposition un lit parapluie pour bébé, un matelas à langer et une chaise haute si besoin. J'aime la musique, je joue de la flûte traversière, j'adore le sport et courir, et je suis très attachée à Strasbourg où j'ai fait mes études et rencontré mon mari. Nous aurons grand plaisir à vous recevoir et à vous faire partager les bons petits plans de Strasbourg. Appartement situé plein centre ville, dans le carré d'or, face à la cathédrale de Strasbourg et à coté de de la Maison Kammerzell. Il est situé au pied du marché de Noël Cathédrale et à 5min de celui de Broglie, qui est le plus grand de Strasbourg. Tous les musées de la ville sont à proximité, ainsi que le célèbre Palais des Rohan. 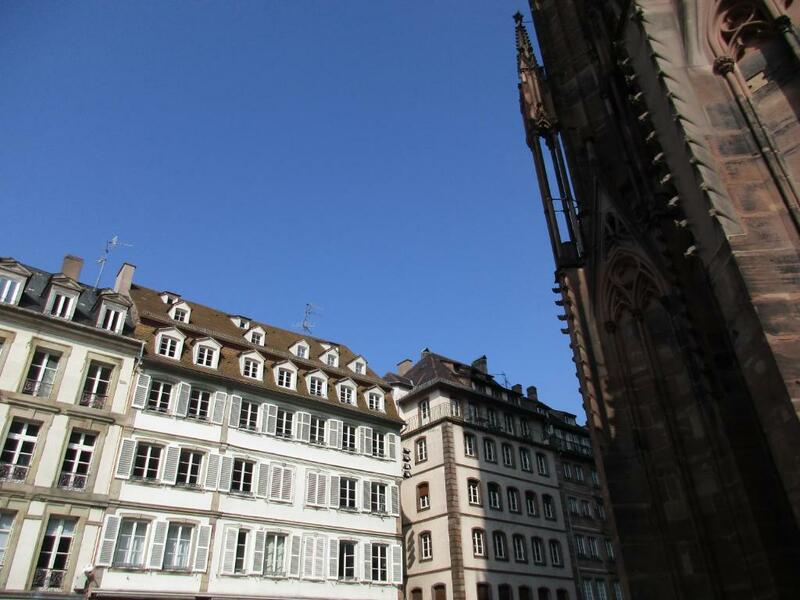 House Rules Les appartements Place de la Cathédrale takes special requests – add in the next step! Please note that guests must notify the property of their approximate arrival time at least 48 hours in advance. A fee of EUR 10 per hour applies for late check-in. Please note that the nearest paid parking are Gutenberg Parking, a 2-minute walk from the property and Austerlitz Parking, a 5-minute walk away. Free parking on street is also available near the property from 19:00 to 9:00. Very large apartment in an excellent location. The apartment had everything we needed for a comfortable stay. It has a lift which was great. Communication with the owner was excellent and he answered our enquiries very quickly. I would highly recommend this apartment for families. Very squeaky floors but old house so can't do much about that. Very squeaky beds. Pillows could have been better. Only one bathroom for a family of 7 was a little challenging. The bed didn’t fit me well. I am 2 meters tall, so beds are often too short, but the footboard kept me from hanging my feet off the end of the bed. The mattress was a bit too soft, which gave my wife a sore back. Everything else about the apartment was perfect. Shower not connected to wall & no lock on BATHROOM door. Plenty of room, clean and comfortable. Great location. 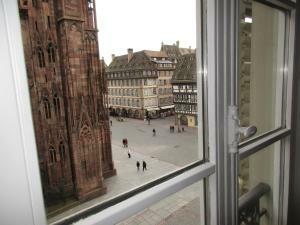 The location of the flat was right at the centre of Strasbourg so very convenient for all the sites. The flat owners were very helpful and welcoming. Overall we had a lovely visit. The apartment has been fully renewed some years ago and still looks nice and clean but the bathroom starts to need a little revamp, especially the bath/shower part. Hosts are top notch, location and view is second to none, with a nice lift, parking near by, great for a family. Lots of glasses, plates, towels... there is everything you need, so all in all, the apartment does the job for a nice stay in beautiful Strasbourg. The parking is so uncomfotable. The host mr. Is very kind and nice. Everything were all good . The shower could use some attention. The location is very central, but unfortunately very very noisy. Even through the closed windows the noise that went on the whole Saturday night on Place de la Cathédrale was audible. We didn't find anything to not like. The host was fantastic to deal with. He was extremely friendly and attentive. Very informative booklet had been put together about the apartment. Apartment overlooked Cathedral square. Buskers in square provided mostly enjoyable background entertainment. Would be pleased to return especially to see Christmas markets.